Since 1965, the Trail of Lights at Zilker Park has been the can’t-miss spectacle of the holiday season. And this year’s display upholds the tradition, with the return of the popular Ferris wheel and the introduction of a “Groovy Grove” for dancing, a carousel in Zilker Village and a replica of Highway 360’s Pennybacker Bridge. With 50-plus displays, this event is definitely a sight to behold. The number of lights strung up along the path. Distance you have to walk to see the whole trail. 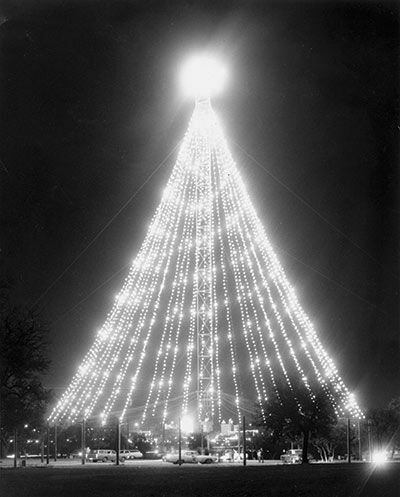 Emma Long, the first woman to sit on the City Council, becomes the first person to flip the switch on the Zilker Holiday Tree, which is actually a moon tower adorned with about 3,300 lights. Cost of the electricity bill last year. The Trail of Lights Foundation pays a flat fee to the Parks & Recreation Department. Crew members and volunteers it takes to set up the show and help out during it. Due to budget cuts the show does not go on for two years. A Trail of Lights Foundation is formed and enough money is raised to bring it back in 2012. Percentage of people who went to the event for the first time last year. Hours it typically takes to assemble the whole display. After a 10-year absence, the Yule Log display returns in 2014. A favorite attraction since the 1960s (the event was once called Yule Fest), it had been previously removed by organizers because of a burn ban.